How To Create Monthly Budget. 1. First enter budgeted numbers for Income. Then enter budgeted numbers for Savings. Balance will be recalculated automatically as: "Income minus Savings". Next enter all budgeted numbers for Mandatory Expenses. Balance will be recalculated automatically as: "Income minus Savings minus Mandatory Expenses". 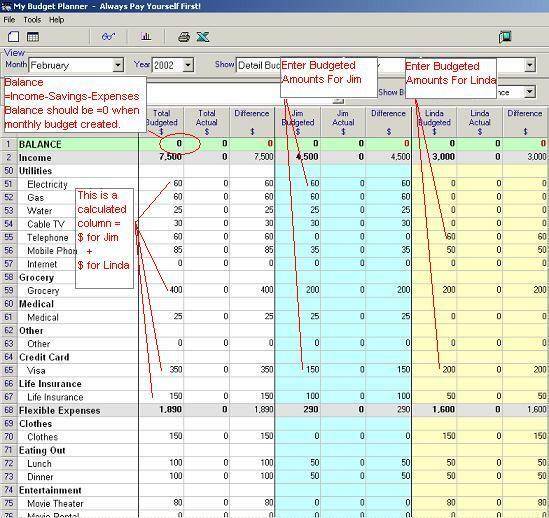 Last enter budgeted numbers for Flexible Expenses. Balance will be recalculated automatically as: "Income minus Savings minus-Mandatory Expenses minus Flexible Expenses". At this point your Balance should be equal 0.
time consuming and your's is essentially the same and much much easier. I would just like to tell you that since using your application, my husband and I have become much more aware of what and where we are spending money. He has now learnt why he should be taking his lunch to work after his lunch bills started adding up to extraordinary amounts. Copyright 2002 My Budget Planner, Inc. All rights reserved.